See how many visits your website records over a short period of time to choose the best moment to add new content or products in order to increase their exposure. How will Concurrent Visits help me? 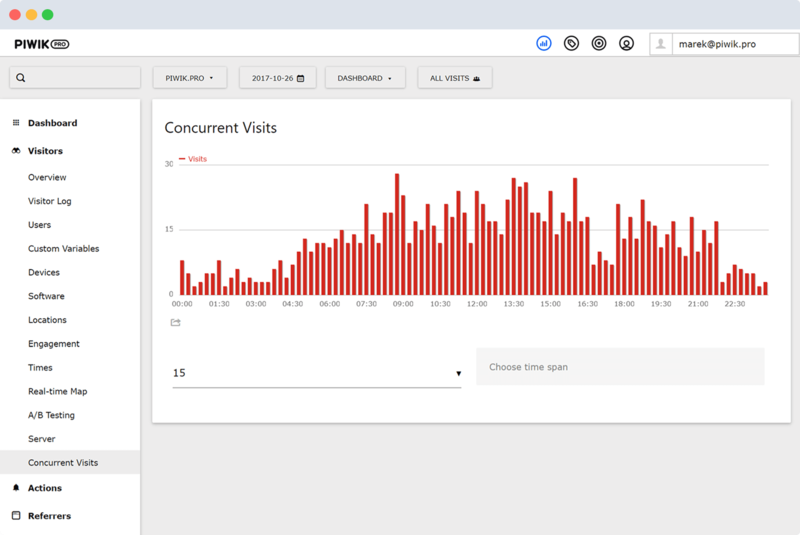 The Concurrent Visits feature in Piwik PRO gives you insight into exactly how many people come to your webpage at different times. Learn whether your visitors prefer to see you during their morning coffee or afternoon tea. The Concurrent Visits feature presents by default information for periods of 10, 15 and 20 minutes, and is configurable. Achieve granularity that helps you be in the right place at exactly the right time. You want to read the biggest audience at the best time. Concurrent Visits reports help you to find the perfect moment for releasing new content by showing you when the largest numbers of people visit your page. Live Concurrent Visits gives you the information needed to make adjustments on the fly. Take immediate action on critical data available right when you need it. Have you got a great new product ready for launch? Reports from Concurrent Visits pinpoint the exact moment when you can achieve maximum exposure. Kick off campaigns with a bang and generate maximum buzz from the first minute using Piwik PRO Concurrent Visits reporting. Even the best content and the hottest products need to be put on your website at the right time to reach the best exposure levels. Concurrent Visits from Piwik PRO shows you the perfect moment to get the message out. Use Concurrent Visits information to add new content and promote products at exactly the right moment for maximum exposure. Focus more eyes on the things you want them to see and generate maximum buzz from the first minute. Boost conversions and get more users into the sales funnel by giving them exactly what they want at the exact time they want it using Piwik PRO Concurrent Visits reporting. You can track as many sites as you want in one Piwik instance using Concurrent Visits, then use the Metasites feature to get a merged report. This will capture all the web properties you need in one.